Artisans in India stitch different, vibrant pieces of cloth together to create this elegant, textural scarf. 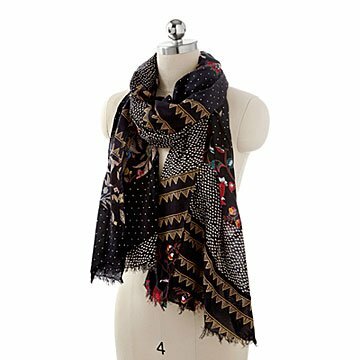 Wrap the colors, textures, and patterns of India around your neck with this scarf. Artisans handcraft the design by sewing together three different elegant strips of fabric. Each is hand screen-printed with either wispy stripes, graphic polka dots, or a smattering of flowers. It's both lightweight and warm, making it a great gift all year round. Handmade in India. Wash Gentle Cycle. Do not Bleach. Do Not Dry Clean. Medium Iron. Low Tumble Dry.